In Episode 353 of The GAP Luke and Joaby talked about Sniper Elite 4. Their preview impressions of the game are also now online at Stevivor & AusGamers. The Sniper Elite series has gained a following over the years because it’s not your typical run and gun shooter. The game requires a bit of patience and planing, but throws in some cool looking action moments when you do pull the trigger. 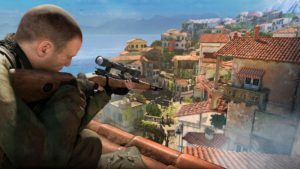 Rebellion has been working on the latest iteration, Sniper Elite 4, and Stevivor had the chance to check it out ahead of its February release. I was able to trial the first mission of Sniper Elite 4 — one which takes place in 1943 on a secluded island in Italy named San Celini. My objective, to kill General Tobias Schmidt and eliminate other high ranking officers in the area. As the mission begins, I’m introduced to a few scenarios that teach me the basics of the game: controls, stealth, combat and managing my inventory. It’s all very linear up until this point, but then the environment opens up and I’m presented with what will be my playground for around 30 minutes. Sniper Elite 4 isn’t a serious sniper game. There is something vaguely silly about it, and Rebellion knows it. They’ve leaned into it for the lifetime of the series, showcasing shots with Matrix style-rotating slow-motion camera angles, Mortal Kombat style X-Ray images of rounds passing through bodies and, of course, testicle shots. It reminds me more of messing about on a mate’s pool table than it does the meticulous and careful adjustment you might make in a ‘real’ sniper game. You’re just cracking off shots and seeing what sticks in Sniper Elite 4 — while on higher difficulties you might feel compelled to try, messing around in coop is sandbox play, as you goof around with little care for the consequences.